Yes…. I know I signed up for the 30 Days of Blogging, but I really fell out of the habit! I tried and tried, but with Thanksgiving and really taking 4 days off away from the computer, it put me very far behind. I have 9 posts that I still need to write. While I may not do them in the month of November, I will get them done. It was really nice being away from the computer for 4 days though. We had a great time off together as a family and took advantage of some R & R. Thanksgiving was nice & relaxing. It was just the 4 of us and we made a nice spread with an awesome turkey made by my husband. Then our sides included mashed potatoes & gravy, sweet potatoes with caramel sauce, green beans with goat cheese, bacon, and cranberries, stuffing, cranberry sauce, and apple pie. On Friday, we went to the zoo. It’s been unusually warm here in Utah, so we wanted to take full advantage of the weather. Our zoo has under gone, and is still undergoing, a lot of reconstruction. I am so glad! The habitats are much more animal friendly than they were a few years ago. Granted, it’s still a zoo but at least they are trying. The kids had fun and we were able to walk around for a couple of hours. Plus the Hogle Zoo in Salt Lake offers some great views of the city, so we took that in as well. Then Saturday & Sunday went by WAY too fast! Why is that? Thursday and Friday went by at a snail’s pace, but before we knew it Saturday & Sunday were gone. Saturday, we had a date night with a couple of our friends. 🙂 My husband set them up and now they are getting married and expecting a baby! YAY 🙂 On Sunday, my father-in-law came over and helped us make Turkey Noodle Soup with our leftover turkey. It was nice being able to use every part of the turkey and not wasting any of it. Some exciting things are happening here at Elite Health Coaching. Make sure you subscribe to my blog & also sign up for my newsletter so I can keep you posted! The newsletter is going to be full of healthy tips, weight loss tips, recipes, and more. Lots of fun things to come 🙂 Thank you so much for reading and I hope that December treats each of you well. Did you do anything fun over the Thanksgiving break? Mostly water. I drink lots and lots of water. I always make sure I get my minimum 64 ounces per day, but I shoot for more. During the hot, summer months I try to get at least 96oz of water. Coconut water. I usually drink the plain coconut water, but it also comes in flavors like Mango, Passion Fruit, and more. Coconut water has a lot of health benefits, including a lot of potassium & natural minerals, and it is great after a work out, to help balance your electrolyte levels. Sparkling water. If you are looking for the carbonation, try sparkling water. You can try the plain, but it often comes in lemon or lime flavors. I’ve also had sparkling water that has flavors added like cucumber, mint, or blueberry. I really enjoy the cucumber water. Make your own flavored sparkling water. In an 8oz glass, add a splash of cranberry juice or orange juice. This will give you a spritzer with flavor. You can also muddle some fruit or vegetables in the bottom of your glass before adding ice and sparkling water. This will give you a nice, natural kick to your water. Try this with cucumbers, mint, strawberries, or raspberries. You could also try a cup of tea. There are lots of different flavors out there and lots of different brands. It’s all about finding the one that works best for you. Have a cup of coffee. Coffee offers a lot of health benefits, but if you are sensitive to caffeine, be careful. I limit myself to 1 cup of coffee per day. That way if I am really dragging, I can have an extra cup and get the benefits of the added caffeine. On rare occasions, I will have an energy drink. But like with coffee, I really do limit these so I can get the full effect of the caffeine when it really is needed. The one I prefer is Steaz because they offer a zero calorie option, that is sweetened with stevia. I hope this offers you a few new options for replacing both regular & diet soda. 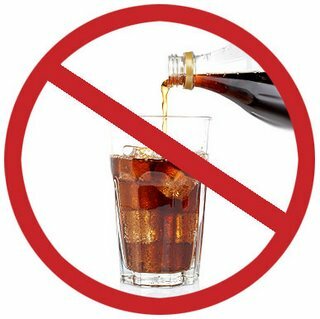 By replacing soda with the above options, you can lose weight, feel more energized, and reduce the amount of sugar and artificial sweeteners you are taking in. It’s been awhile since I posted a recipe, but in Utah a few weeks back we got hit with a snow storm that dumped about 2 feet of snow in a 48 period. It was great and we had tons of fun playing in the snow, but now it’s all gone. But when it was nice and snowy, I wanted some comfort food. It may not have been the healthiest meal in the world, but it sure hit the spot. We served this up with some grilled cheese sandwiches. Combine potatoes, carrots, celery, onion, parsley, salt, pepper, and chicken broth in a pan. Cover and cook over medium heat for about 40 minutes. In a bowl, whisk flour into evaporated milk. Then stir evaporated milk, flour, and butter into the pan. Cook for another 30 minutes on low heat. Once done cooking, top with bacon and cheese. Plan ahead. If you know you’re going to be running around, make some snacks ahead of time. These snacks don’t need to be elaborate. Pack some carrot & celery sticks with hummus, a piece of fruit, a hard-boiled egg, or a piece of string cheese. If you are going to be gone all day without access to a fridge, put these items in a small cooler that you can keep in your car that is within reach. Pack water! When running around all day, you’ll definitely get thirsty. So pack enough water to get you through the day. You can put the water in the same cooler as your snacks. That way you can avoid having to make a pit stop at a grocery store, convenient store, or fast food restaurant, where you may be tempted. If all else fails and you HAVE to stop somewhere for food, look at your options. A lot of convenient stores will have fresh fruit, a small vegetable tray, and nuts that you can snack on. When eating at a fast food restaurant, it can get a little bit trickier. Try getting a salad with the dressing on the side. Try getting a soup or chili, instead of a burger and fries. Avoid the shakes and fried foods. These may not be ideal choices, but your waistline will thank you. The key to success is planning ahead. Having readily available healthy snacks throughout the week will help you stick to eating healthy, without the feeling of dieting. Spending an hour or so in the kitchen, one day a week, to prepare snacks will help cut down prep time when you are in a hurry and need something fast. Also if you have kids, and they see these small serving size snacks in the fridge, they might be more apt to grab these rather than cookies, chips, and other unhealthy snacks.